There are just some places in the world where certain foods are just better; there can be a lot of moving parts that causes this to happen, such as how close you are to the water, local suppliers, etc. But whatever those moving parts are, it seems like Chef Corey Fletcher at Granite Restaurant & Bar in Concord, New Hampshire have made them all work in his favor. Now I am not a New England Clam Chowder connoisseur, and I am not quite sure how the most delicious clam chowder is supposed to taste, my expertise really just extends to knowing New England is white and Manhattan is red, but I do know what I like. This clam chowder was creamy which I think chowder should be, there was a respectable amount of clams inside, with hearty pieces of celery and of course oyster crackers already placed delicately on top. 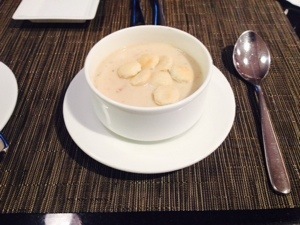 Now from an unsophisticated palate in this area I would say this chowder was fair, it was only slightly seasoned, it didn’t evoke any happy feelings and it didn’t make me regret that I got the cup versus the bowl. Now being so close to Boston I certainly expected a more palatable experience, but it just ranked as something I certainly could pass on the next time. Continuing with my motto to never just stop at appetizers or soup I proceeded to my entree which was a meal that allowed me to take a glimpse inside the heart of the Chef…this has never happened before. 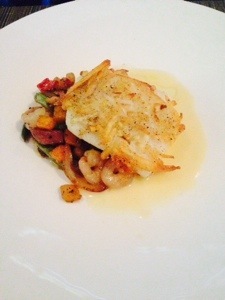 The Potato Crusted Haddock with baby shrimp, pancetta, wild mushrooms, seasonal vegetables, and white wine butter sauce. This potato was like a lightly cooked hash brown laid atop the haddock, the delicate fish was not compromised at all by the way it was cooked, it tasted light, fresh from the ocean, and seasoned ever so superbly. When the fish is placed on the fork with the vegetables, pancetta (italian bacon), and a swivel of white wine sauce, the palate explodes, you breathe a little heavy from your nose, your shoulders come down from your ears, and you sit back just a little bit further in your seat. When eating this meal I could totally tell that this Chef has a heart for his work, his precision is seen in the orchestration of the flavors, and the fact he opted to give the clientele local and farm raised food exposes his thoughtfulness. To incorporate the pancetta almost makes me see his whimsical yet bold side of his personality, knowing that pork is the super meat with huge flavor, yet understanding how fun it could to put the two together. 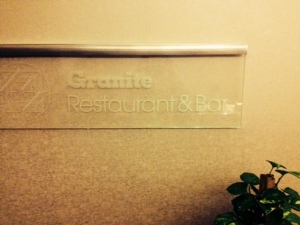 Granite Bar & Restaurant is a little local secret that is worth making it no longer a secret by telling everyone you know…well done Granite Restaurant & Bar, well done. Makes me want to visit New Hampshire and experience the chef’s work!! !